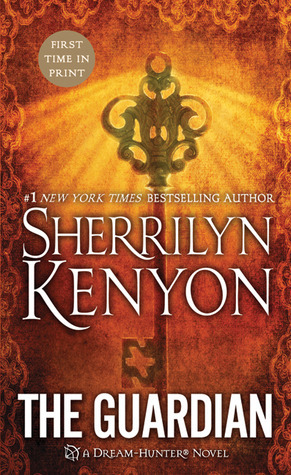 This book reminded me why I fell in love with Sherrilyn Kenyon. For me, the Dark-Hunter series has kind of lost its way a little bit lately. But The Guardian felt a lot like some of the earlier books that I loved so much. It’s technically a Dream Hunter novel, but it brings together many different threads from previous books. We’ve got many of the Dream Hunter characters we’ve met before, like Solin, Delphine & Jericho. But our heroine is half Dream Hunter, half Kattagarian… so we’ve got a healthy dose of Were-Hunter. AND our hero is a slave to Noir, which ties us into the whole Azmodea/ Hellchaser storyline. Plus we get a visit to Sanctuary and a Malachai connection. If all that sounds intimidating, well, I’ll be honest when I say there were times my memory was creaking, trying to remember all the elements from the previous books. But Kenyon does a good job filling in the blanks and bringing you up to speed. And besides, the real draw of this book wasn’t all background stuff anyway: our main couple stole the show. Seth is part Egyptian God, but was cast out by his parents as a child. He has been rejected and betrayed his whole life, and has spent thousands of years as a slave to the primordial god Noir. He has been tortured beyond any point I could convey to you. He’s never known love. In short, he is a super-awesome- dreamboat of a tortured hero. By the bidding of his master, Seth has been torturing the Dream Hunter Solin to get him to reveal the location of the key to Mt Olympus. But then, Solin’s daughter Lydia comes to rescue her dad. She becomes Seth’s prisoner, while Solin goes to get the key. As his captive, Lydia spends more time with Seth and gets to see the man behind the mask he wears as Noir’s Guardian. And she wants to show him all the love he has never known. She didn’t know what made her hurt the most, the sincere honesty in his voice or the expectation of pain she saw in his eyes. He spoke as if he were nothing more than a trained monkey with no other purpose than to service her and go. Of course, he didn’t. Because no one had ever touched him with a loving hand. They had used him, abused him, and then thrown him away his entire life. But that was going to change. I really enjoyed this book alot. Kenyon is sooo good at writing tortured heroes and this reminded me a lot of Dance With the Devil in tone. My only complaint, was that ending felt a little bit rushed. Maybe more than a little bit. But I can forgive it. I really think fans of the series are going to be happy with this one. I definitely was. 4 1/2 stars. 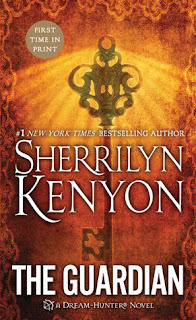 I’m really glad to hear this one reminded you of the tone of Dance With the Devil because I think the earlier books in this series (Acheron and earlier) are the best ones. Can’t wait to start this one. I love the DH series, but the most resent ones are very different than the 1st few. I LOVED Dance With the Devil. That’s my personal favorite in the series. Can’t wait to get my hands on this book! Thanks for the great review.